I went to the second annual Sew Crazy Retreat at LION’S BEAR LAKE CAMP in Lapeer, MI this past weekend. ( January 23-24-25th) I had an absolute blast. My table partners were Joyce and Carol Ann two delightful 80s something ladies. They regaled me with stories about their 58 year friendship and what FLINT MI was like in the old days. And boy could these gals do some sewing. They were funny and interesting and kept me on my toes. I camped in cabin #5 with Charlie and her crew of friends and we had a wine and cheese party that first night. This group of friends had been sewing together for years also. I will be posting some pictures of various quilt projects being worked on and some finishes in a future post. I was so busy taking pictures of other people quilts I did not do a good job of keeping an update of my quilt project. I started out with one assembled row at the beginning of the retreat on Friday afternoon. I was able assemble rows 2 thru 6 and am on the final piecing of blocks for row 7. Below is the last picture I took of the quilt on Saturday afternoon. From then on I forgot to take pictures. My girlfriend ROXIE has used the pattern several times and she loves it. It is her go to pattern when she needs a fast quilt. She uses yardage and strip pieces the secondary blocks. I of course have to do mine the hard way no easy chain or strip piecing for me. This is the pattern that inspired my quilt. I made my blocks 14 inches finished for this quilt. My girl friend and I have redrafted the pattern for different size blocks for baby quilts. They turned out very cute. I love the border on the original pattern and hope to be able to use it on my quilt. I might have to come up with something different as I have “lost” strips needed for the border. 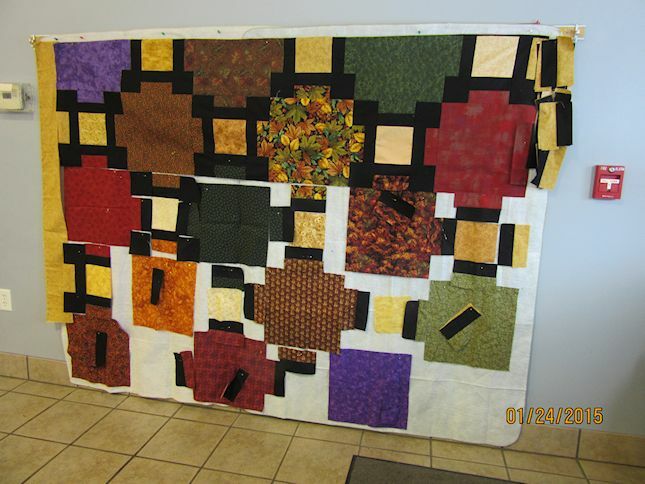 I have been making this quilt at several different retreats and sew-ins. Some how the border strips are missing. I thought the secondary block was called HOLE IN THE BARN DOOR, but when I looked it up they are not the same block. If you know the name of the second block please let me know. I have links to SWIRLY GIRL DESIGNS as they have several other patterns that ROXIE and I want to make. Well I am tired as it has been a wild and busy week end. … so off I go to bed.. gosh it is not even 8:30 pm. REMINDER: Scrap in Box MYSTERY Quilt will be starting soon…. Just a reminder the TWILTERS on TWITTER will be starting on Charlotte’s SECOND Mystery quilt. I am posting the links for anyone that wants to join in with us. If you do not know Charlotte she lead us in a mystery quilt last year … it was absolutely lovely. CHARLOTTE’S WEB PAGE for SCRAP IN THE BOX. Flicker page for SCRAP in the Box Mystery Quilts… NO PICTURES as of today. I am somewhat disappointed in this book. Part of the disappointment is my own fault as I have read over 20 books on color theory in the past several year. Most of those books were heavy into theory and could have been used in any design or color theory class as text books. I think I was expecting an in-depth exploration of color theory as used in modern quilts. I felt this book was light on explanation and relied mostly on beautiful photography and color plates to make the book attractive. As this book was written by mostly modern quilters I was expecting an explanation of MODERN QUILT color selection and theory and how it is different from TRADITIONAL QUILTS. The book does list in brief paragraphs color relationships and terminology, but it was light in details and explanation. It does demonstrate each of the color relationships ( ie monochromatic, analogous, complementary etc. ) in several blocks. Each block was made using the different color relationships and is highlighted by a small color wheel next to it demonstrating the relationship. This did help show the relationship between the colors in a block. I do think they should have explained how value between the colors helps establish the patterns. There was only a few sentences discussing the impact of value on colors in a block, pattern or in a quilt. 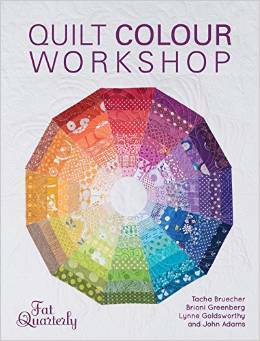 What I did like about the book , QUILT COLOUR WORKSHOP , is some interesting modern style quilts. Each of the quilt blocks and projects demonstrate a color relationship. There were several quilt patterns that I liked enough to consider making. ( AFTER my current projects are completed.) 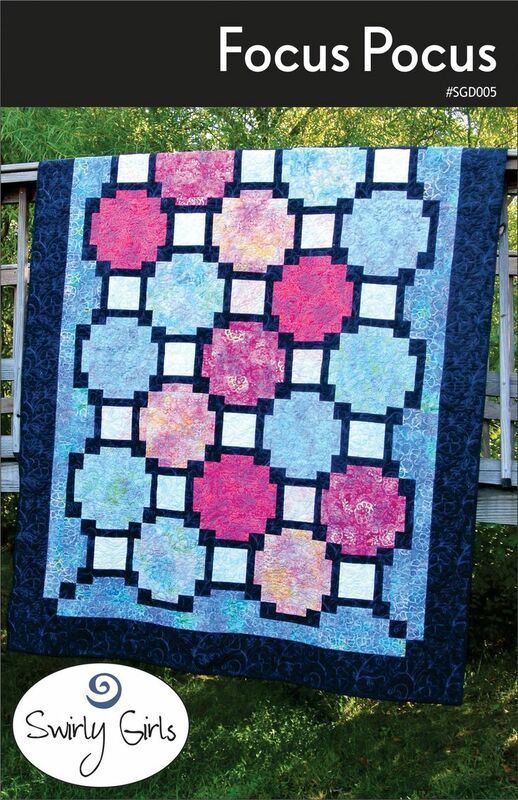 I would even consider making the quilts exactly as presented in the pattern. I found the patterns to be very graphic and contemporary in style and that to me was intriguing. I think my younger generation would like these quilts. I loved the quilt called CALM BEFORE THE STORM, it was a monochromatic red and white quilt. I also enjoyed the quilt they called MODERN VINTAGE WEDDING RING ; they classified this as split complimentary but I enjoyed it because of the soft , muted tones and neutrals. I think this book could have been better with more detailed explanation of color theory. I also think they wasted pages with color plates as chapter headings. I would have much rather had head on pictures of the quilt projects. They had some nice stylized pictures of the quilt projects on beds, draped over a chair, etc. I would rather have close ups and straight on shots of a quilt. I like visual details of the projects I am considering. Some of the straight on shots of the projects looked more like digital ( EQ7 )mock ups rather then a photograph of a real quilt. This book was more glitz and glamor then substance. I really would like a book that explains color theory in detail as applied to modern quilts. I have my own theories based on observation and critiquing modern quilts I have seen but I would like modern quilt authors to delve into the discussion . I rated this book 2.5 out of 5 originally but then I upgraded it to 3.0 because I liked several of the patterns. As a detailed explanation of color theory I feel it was seriously lacking and you should look for your information else where. I recommend most of the books by Joen Wolfrom. She also has a great blog where you can learn a lot about color theory. I have been touting the fact that I like DVDs better then on line streaming in several blog post. I have decided to post the links to where I bought my DVDs for others who might like to buy quilting DVDs. The list is in no particular order. I have deleted any source that was unsatisfactory. I have enjoyed the DVDs I have purchased from these source but as always you should always think twice before buying on line. I do wish this shop would separate DVDs from the book. It is hard to navigate and find the DVDs you might wish to purchase. Carries many of the same dvds as found at Fons and Porter. Expanded collection of DVDs … mostly QinD but also other well known quilters.